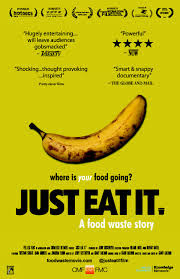 Finally, a food-stunt-marathon movie that Morgan Spurlock (SUPERSIZE ME) didn’t think of. And perhaps he should have. The couple's docu-diary shows the progress of this unappetizing experiment, and guess what? (SPOILER ALERT) Far from starving, the couple take home more food than they can possibly consume. Even gourmet and “organic” premium-specialty food, thrown out behind markets by the truckload. Grant gains an unflattering amount of weight. Their ordeal accompanies interview sidebars from the likes of authors Jonathan Bloom and Tristram Stuart, plus growers and insiders, about the culture of wretched excess and corporate pathology (bigger portions in restaurants, more food than is needed) that puts millions of tons of edibles in trash bins. For bleeding-heart conservatives, there’s the detail that heavy-handed government regulation of the food industry means hard-and-fast “expiration dates” for packaged foods that err on the side of overcaution – meaning loads of perfectly okay meals being destroyed because of the near impossible chance of spoilage.